Buckwheat was found in a field near the Charlotte, North Carolina airport the first part of November in 1989 when he was about five weeks old, so his chosen birthday is October 2. My oldest son was living in Charlotte at the time, and he and some friends had gone over to watch the planes. Mike heard faint, tiny mews coming from the weeds and went to investigate. What he found was a cold, starving, frightened bundle of fur. He put the kitten in his jacket and took him home even though he lived in a "no pets" apartment. He took care of the little guy and named him Buckwheat. When my husband, youngest son, and I went down to spend Thanksgiving, Mike asked if we would take the kitten back home with us. Of course, we did, and he has turned out to be a very BIG (20 pounds) part of our family. Needless to say, he also has a fondness for food. He's not the friendliest cat in the world; but he's ours, and we love him! Carly came into our lives in 1996. She was a "street cat" being complained about by all the neighbors because she was always doing and digging in their flower beds. One neighbor was just about ready to call the animal warden to come pick her up. She was being fed by my sister who lives three houses away from us. My sister already had five cats and a rabbit and felt she couldn't take another. When she went on vacation, it was up to me to take care of her babies and feed the outside cat. One day I was playing inside with her cats and noticed Carly outside on the window ledge looking in. My heart just broke because I knew she wanted to be a part of what was going on inside. When I went out to feed her, she didn't like what I put down. I told her to come up the street with me and I'd give her some food she'd like. She trotted right up with me and ate her new food contentedly. The next day she was right there on the porch waiting for the good food. My husband was sitting on the couch, and I asked him what he thought would happen if I opened the door to invite her in. He said, "Do it and see." So I did! And she has never had any desire to go out that door again. We chose August 15, 1995 for Carly's birthday. She's a beautiful little girl, all sweet and cuddly. Everyone that pets her makes a comment on how soft her fur is. She sure does love to sleep on the couch with her mommy, and she is definitely a "Mama's Girl"! My sister found Jessie on Wednesday, October 7, 1998, outside her office. The office is located on a very busy street near a high school. 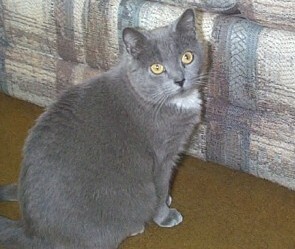 The little grey cat was scrawny, dirty, very hungry, and covered with cuts and scratches. Being my kindhearted sister, Reva fed the cat the rest of her lunch (spaghetti) which was devoured ravenously by the kitty. Reva called me from the office telling me all about it. All I could say was "poor little cat" over and over. The cat was still by the office door when my sister was leaving to come home, so she brought the cat home with her. Reva has five cats, three ferrets, and a rabbit of her own to care for. Her heart is WAY big! She left the "new" cat in her garage overnight and the next day. Thursday night when she came home from work, I got a call from her telling me she couldn't find the cat. It had escaped from the garage and was nowhere to be seen. After questioning the neighbors, we found out where she was last seen. Rev and I prepared to scour the neighborhood when a youngster on a bike went by. I asked if a grey and white cat had been seen and was rewarded with a "Yes, it's down the street at my house." So my sister and I retrieved the cat. This was the first time I had seen her, and she was a dirty mess and polluted with fleas. My sister decided to bathe the cat with the help of my youngest son, Tim. In the meantime, I had called the Vet for an appointment to get the new little girl checked out and spayed. She stayed quarantined at my sister's house until Monday morning when she was taken to the Vet's office. 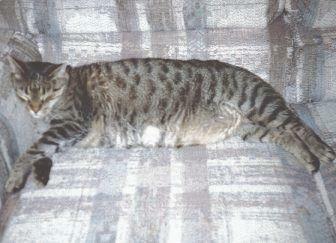 She was estimated to be between five and seven years of age by the vet. So I say she is 6 years old with a chosen birthday of October 12. Her big name is Jessakitty. Jessie suits her fine. The Doc also said she'd had it pretty rough outside for quite a while. She passed all her tests with flying colors (except for ear mites) and came home to live with us Monday evening. (If you wonder why we did not search for previous owners, it is because anyone who would let a precious cat get into such horrible condition DOES NOT DESERVE TO OWN AN ANIMAL!) After introductions between the cats, we monitored them closely for a few days until things got more normal. Buckwheat is just Buckwheat. He could really care less as long as he is left alone. Carly, on the other hand, was less than thrilled to have a new sister. She has since come to tolerate Jessie, and the two girls actually play with each other now and again. Jess has gained weight (from 7 lbs. to 10 lbs. ), her coat is shiny, and she is healthy. She fits into our household quite well. She prefers to sleep at night in the bed with us and spends most of the day awake. She loves to keep herself amused with all the cat toys. I wonder if she ever had so many before. She acts more like a puppy, following her Daddy from room to room. And she will follow ANYONE to the kitchen, just in case they might want to feed the kitty! Nicky is our newest "baby". 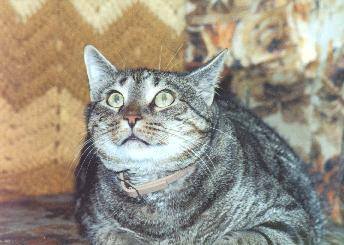 He showed up at my mom & dad's house around September of 2000 and made friends with Mom's cat, Gabby, through the screened porch. He was quite a little thing and just a touch feral. I don't think he'd ever been touched by a human. For the longest time, he would run and hide any time he saw a human. Mom started putting down food for him, and he got to the point where he would stay in sight when Mom or Dad would be outside, but he still kept his distance. Some time in October, Mom started feeding him some "people tuna" and got to the point where she could touch him on the head. But he still wasn't having any of it. If one got too close, he was off like a shot, especially if that one was me. Mom & Dad go to Florida every year for our winter, and the time for them to leave was approaching fast. I kept telling myself that I would be able to make friends with him and catch him before they left. Not so. He didn't want to be my friend. He just wanted to be fed and left alone. Well, the day came when Mommy and Daddy packed up their own cat and baggage and headed for the sunny south. 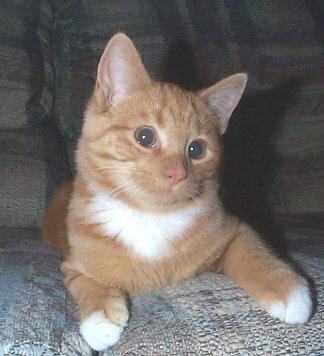 I had no choice but to go to my parents' house each day to feed the little feral kitten that wouldn't be mine. About the fourth or fifth day that I went to feed him, I left the garage door open, which I never did. Did it that day, though. Well, feral kitten went running into the garage ('cause when Mom & Dad were home, the back door was always open and he could go through to the back of the garage) and I was right behind him. So I closed the garage door. It took me a good two hours to capture him, and we were both sweaty and dirty as we could be. (Daddy's garage will NEVER be the same!) I put him in the carrier I was keeping at Mom's just for that purpose. Took him straight to my vet's office for testing and medical attention. Brought him home the next day and when my husband came home from work, I said, "Guess what?!!! We got a baby today!" Nicky's been neutered and is a really good boy -- although he is as ornery as cat stuff can be! Wouldn't want him any other way!!! Set YOUR site on TRIPOD ...FREE! All Web site building and hosting services place an ad on their members' pages. These ads pay the bills and keep the service FREE.